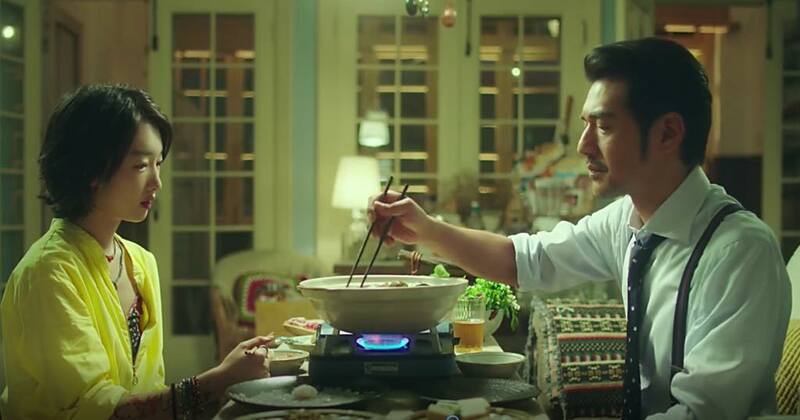 Starlet Zhou Dongyu displays a new level of maturity opposite Takeshi Kaneshiro in this culinary-themed Chinese rom-com. Dining is the most personal experience one can have… to share that experience, is to expose one’s heart and soul. Zhou Dongyu brings us a rather cheerful romantic comedy with costar Takeshi Kaneshiro (of Red Cliff fame — in which he played legendary military strategist Zhuge Liang) in This is Not What I Expected (我喜欢你, lit. “I like you”). Playing the role of star chef Shengnan at a Shanghai hotel, Zhou elevates her spontaneous, innocent, and child-like cute personality to a more mature level of acting as she develops a relationship with her hotel’s potential buyer, Lu Jin (Kaneshiro). Any regular reader of Cinema Escapist will remember that I’ve been a fan of Zhou Dongyu since the days of My Old Classmate — often seen as her acting breakthrough. However, since My Old Classmate, Zhou has matured in her acting to encompass a deeper embodiment of the emotions of her character. Not only is she more authentically “cute” in the cheerful moments where she playfully tries to hide her identity from Lu Jin (who remains unaware that Shengnan has been cooking his favorite dishes for half the film), but she also develops an innocent jealously and anger — the first time I’ve seen from Zhou — when she finds that Lu Jin has another personal chef at home (a cameo appearance by another one of my favorite actresses, Lin Chi-Ling). While Zhou retains the same playfulness that delighted audiences in My Old Classmate or Soul Mate (at least earlier on in the films), it’s refreshing to see her in a more mature context, especially with a character whose storyline spans not decades but merely months. However, I’ll have to admit that what first attracted me to this film was the culinary theme. As a globe-trotting foodie, the indulgent and creative dishes that Zhou’s character spins up were mouth-watering masterpieces. Director Xu Hongyu put together an impressive spread of dishes ranging from humble pastas and soups to perfectly-cooked herb-crusted rack of lamb — it’s as if Gordon Ramsay was a culinary adviser to the movie. If I really had to pick at the film, I’d remark at how Lu Jin has a relatively flat character throughout the film. While the spotlight is indeed on Zhou’s Shengnan for two hours, Takeshi Kaneshiro is an amazing actor in his own right, and deserves a character whose emotions and expressions go beyond an appreciation of fine dining. Kaneshiro’s character appears neglected when placed next to Zhou’s Shengnan. Playing my hand at food & wine pairings, This is Not What I Expected is the perfect accompaniment to a lazy weekend afternoon, best enjoyed with a Gin & Tonic or a bottle of Sauv Blanc — right before a filling dinner. The boozy indulgence will only serve to emphasize Zhou Dongyu’s emotive acting, while the film’s heavenly portrayal of cuisine is better than any aperitif to prepare you for dinner. This is Not What I Expected (Chinese: 我喜欢你)—China. Directed by Xu Hongyu. First released April 2017. Running time 1hr 46min. Starring Zhou Dongyu and Takeshi Kaneshiro, with appearances by Lin Chi-ling.